Rogue | Beer Apprentice - Craft Beer News, Reviews, Interviews and Info. Hello everyone. I appreciate you checking back in on another craft beer review. Today, I’m going to be drinking the Chatoe Rogue First Growth Good Chit Pilsner produced by Rogue Ales situated in Newport, Oregon. We all know about Rogue, so let’s just go ahead and jump to the website, rogue.com, and see what this beer is all about. Good Chit Pilsner is made with Rogue Farm barley that we Floor-Malted in small batches. Floor Malting is an, old fashioned, 8 day process that includes steeping, germination, raking, roasting, bagging and hands on love 24 hours a day. “Chit” refers to the start of the rootlets that emerge from the embryo of the kernel once steeping is complete and germination begins. Ok. Let’s get it in a glass. This beer came in a 22 oz. bottle and it had an ABV of around 5.2%. It poured a clear, golden/yellow color with some brighter yellow highlights around the edges of the glass. The well sized cap was bright white with a soft and fluffy composition. Both the retention time and the lacing were solid to the core. The nose smelled of clean grains and grassy hops. Some semi-sweet malts and tones of wafers or crackers followed. A light hint of lemon and some floral fragrances brought up the rear. Nice, soft and balanced in my opinion. I liked it. The taste was almost exactly like the aroma. The only exception may have been that it had a touch more of the grassy hops. Other than that, the clean grains and cracker like complexities held true while the lemon citrus complimented the soft malts. Again, very nicely balanced and proper. The mouthfeel was medium to thin bodied. Smooth, crisp, refreshing and thirst quenching. A nice, fairly lively amount of carbonation was to be had also. An ok amount of flavor was left behind after each sip too. Overall, I found this to be a solid beer for sure. Absolutely perfect for Spring and/or Summer. It had plenty of character for discussion, yet retained an ease of drinkability that fell in line with a beer of this style. To be honest, this is one of the better Pilsners I’ve had in sometime. I’ll definitely pick it up again next Spring for sure. I would advise you to do the same. Especially, if you are looking for a sturdy Pilsner with a subtle hop kick. 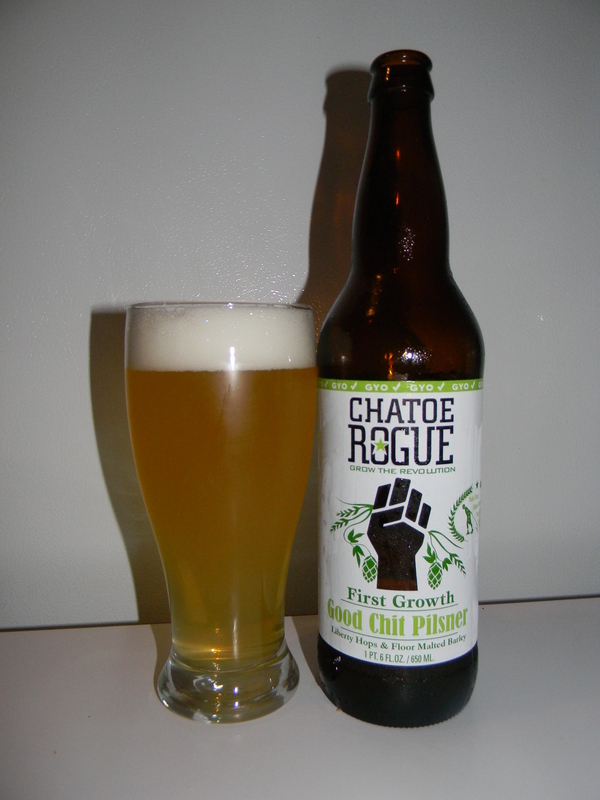 So, if you guys happen to try the Chatoe Rogue First Growth Good Chit Pilsner let me know of your opinion. I’d love to hear from you. Thanks for reading and commenting everyone. I really, really appreciate it. Hi guys. 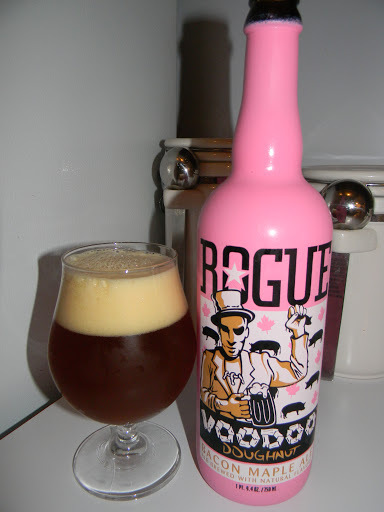 For today’s craft beer review I’m going to be trying the Rogue Voodoo Doughnut Bacon Maple Ale produced by Rogue Ales located in Newport, Oregon. I can’t wait to try this brew because, as we all know, this has been one of the most talked about beers produced in 2012. Let’s jump to the website, rogue.com, and read the commercial description. This beverage comes in a 25.4 oz. bottle and it has an ABV of about 5.6%. It poured a deep amber color with an off white head that formed to a very good size. It was smooth and kind of creamy. The retention time and the lacing were both well above average. Honestly, it looked pretty nice and inviting standing in the glass. The aroma released the maple syrup for sure and a good deal of smoke was noticed right off the bat. I found a little bit of bacon in there too along with some caramel sugar. That’s about all I could pick out really. I didn’t find the bouquet to be quite as “loud” as a lot of others have said. It wasn’t horrible I didn’t think. The taste wasn’t all that strong either. I definitely discovered some of the syrup with a very relaxed smokiness. Touches of bacon fat and a little bit more of the sugary caramel. I thought it was balanced pretty well. I don’t necessarily think the flavor was world-class, however it wasn’t all that bad to tell the truth. Just different I guess. The mouthfeel was medium to medium/thin. I thought it would be much fuller. Oh well. It was quite dry and somewhat chewy. The carbonation was decent, however not a terrible amount of flavor was left behind on the palate. Well, I didn’t think this beer was THAT bad. I don’t think it is something that I would want to drink everyday, but I’m glad I got to try it. It’s quite unique and I applaud Rogue for creating it. I’d drink it again if it were offered. I think it could pair well with the cooler weather. The drinkability wasn’t real good, but I made it through the bottle with no trouble. So, if you guys are looking to try something a tad different, give the Rogue Voodoo Doughnut Bacon Maple Ale a try a see what you think. Some will be turned off, although I do think it has its place in the beer world. Be sure to let me know how you interpreted it if you’d like. Hello everyone. For today’s craft beer review I’m going to be trying the Rogue Morimoto Imperial Pilsner produced by Rogue Ales situated in Newport, Oregon. Rogue has always been one of my favorite brewers and this beer is one that I’ve been looking forward to getting my hands on. I need to thank Adam Hudak and Stephanie Suratos for providing me with this brew. 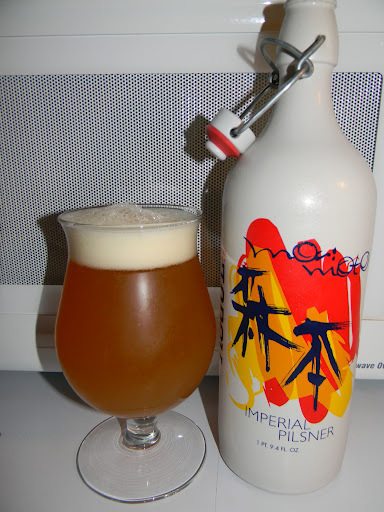 Let’s get to the website, rogueales.com, and see what kind of information we can find on the Morimoto Imperial Pilsner. Golden in color with a dry hop floral aroma and intense hop bitterness supported by a big malty backbone which culminates into a hedonistic mouthful. I’m ready. How ’bout you guys? This brew comes in a 25.4 oz., very cool looking, ceramic bottle and it has an ABV of around 8.8%. It poured a hazy, golden orange color with a white head of average size. It was very smooth, somewhat creamy, soft and tight. The retention time was rather good and the lacing was sturdy with patches left on the sides after tilts and sips. The nose started with a reasonable amount of tropical fruit citrus. Hints of flowers, pine and grass. A very clean smelling brew. After it was allowed to sit and warm a touch, an easy essence of bread, biscuits and straw began to overtake the aroma. Some type of spice hid underneath for more elaboration. By the end of the drink only a faint trace of the hops remained as the bready malts had pretty much taken over. That’s not a bad thing either. I enjoyed it quite well. The taste was very similar to the fragrance in that it started with quite a bit of citrus. Savors of pineapple, grapefruit and other tropical fruits. Again, quite floral and piny with some spicy compliments. Very sweet and bitter. The bready/biscuit malts and grassy components gradually started to move in for the kill after the brew got closer to room temperature, but I still thught it tasted mightly fine. The bitterness seemed to remain constant throughout and overall, it was significantly stronger in the taste than the aroma. The mouthfeel was medium bodied. Very dry, sticky and smooth with a little bit of a spicy bite. A very nice amount of carbonation was to be had and a solid dose of flavor was left covering the palate long after each sip. I’ll tell ya. I’m not normally a huge fan of Pilsners, but this beer was very good. I liked it a lot. I realize that it’s been bumped up quite a bit from a normal Pilsner, so that could be swaying me a tad, however it was still able to reatain some of that classic Pilsner bready malt and grassiness. I would have no problem picking this thing up on a regular basis I tell ya. I would suggest that you do the same if you can obtain it. It has a nice aroma, a full flavor and the ease of drink is outstanding. I had no trouble working my way through this bottle. I sped through it rather quickly. The Rogue Morimoto Imperial Pilsner could be had at anytime of the year in my opinion, yet Spring seems to me to be the optimal time to enjoy this beverage. Be sure to let me know what you think of it if you’ve had it.